Developed by Top 100 Pro Ted Sheftic, the Accu-Roll is one of the simplest putting alignment devices ever made. Affix the Accu-Roll to the face of your putter (double-sided tape provided) and itâ€™s like having a caddy lining up every putt. The second benefit of using the Accu-Roll is that it works on improving your stroke. By placing the ball inside the triangle you will get immediate feedback on your strokepath. The ball will only be released straight towards the target if your putting is traveling on the target line at impact. 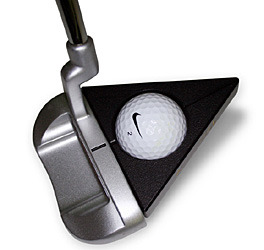 We recommend using the Accu-Roll for practicing putts 10â€™ and in. Within a few minutes you will be able to accurately see the line and get the ball rolling to the target. If you have any questions regarding the Accu Roll, please give us a call, we would be happy to help you with any questions you may have. Write an online review on the Accu Roll, and share your thoughts with others.